Come see us at TRANSACT Booth #2503 or visit VitalPOS.com today. features 14	Forty Under 40 Through entrepreneurship, leadership, and innovation, the 2019 ETA Forty Under 40 class has made significant contributions to the payments business. This year's honorees hail from top companies across the industry and are fundamentally reshaping the digital payments ecosystem. 	Results of the ETA-commissioned J.D. Power survey of satisfaction among small and medium sized businesses are positive for merchant services. Still, four key factors—cost of service, service interactions, payment processing, and equipment and technology—demonstrate the importance of communication and measurement when improving client relationships. Here's an inside look at the data. Editorial Policy: The Electronic Transactions Association, founded in 1990, is a not-for-profit organization representing entities who provide transaction services between merchants and settlement banks and others involved in the electronic transactions industry. Our purpose is to provide leadership in the industry through education, advocacy, and the exchange of information. The magazine acts as a moderator without approving, disapproving, or guaranteeing the validity or accuracy of any data, claim, or opinion appearing under a byline or obtained or quoted from an acknowledged source. The opinions expressed do not necessarily reflect the official view of the Electronic Transactions Association. Also, appearance of advertisements and new product or service information does not constitute an endorsement of products or services featured by the Association. This publication is designed to provide accurate and authoritative information in regard to the subject matter covered. It is provided and disseminated with the understanding that the publisher is not engaged in rendering legal or other professional services. If legal advice and other expert assistance are required, the services of a competent professional should be sought. Transaction Trends (ISSN 1939-1595) is the official publication, published four times annually, of the Electronic Transactions Association, 1620 L Street NW, Suite 1020, Washington, DC 20036; 800/695-5509 or 202/828-2635; 202/828-2639 fax. POSTMASTER: Send address changes to the address noted above. Copyright © 2019 The Electronic Transactions Association. All Rights Reserved, including World Rights and Electronic Rights. No part of this publication may be reproduced without permission from the publisher, nor may any part of this publication be reproduced, stored in a retrieval system, or copied by mechanical photocopying, recording, or other means, now or hereafter invented, without permission of the publisher. Global Payments is proud to be a sponsor of ETA Global Payments Inc. (NYSE: GPN) is a leading worldwide provider of payment technology and software solutions delivering innovative services to our customers globally. Our technologies, services and employee expertise enable us to provide a broad range of solutions that allow our customers to accept all payment types and operate their businesses more efficiently across a variety of distribution channels in many markets around the world. Headquartered in Atlanta, Georgia with approximately 11,000 employees worldwide, Global Payments is a member of the S&P 500 with customers and partners in 32 countries throughout North America, Europe, the Asia-Pacific region and Brazil. For more information about Global Payments, our Service. Driven. Commerce brand and our technologies, please visit www.globalpay.com. ÂŠ2019 Global Payments Inc. All rights reserved. they view contactless payment methods as more convenient—nearly double the 22 percent who consider cash to be the easiest way to pay. Perhaps one of the more surprising findings was that 54 percent of German consumers said they believe cash will become obsolete in as little as a few years. “Contrary to the traditional ‘cash being king’ mindset, our study reveals a definite shift in consumer preference to more convenient methods of payments,” said Jörg Brand, First Data’s general manager of Germany DACH. Despite the widely held belief that security concerns prevent German consumers from embracing cashless payment methods, 63 percent of respondents said they made contactless payment without fear of fraud or theft, and only 26 percent of Germans indicated that they still distrust card payments. First Data found that Generation Z consumers are the most trusting of electronic payment technology—only 20 percent of respondents aged 18 to 24 said that they feel wary of electronic payments compared with 29 percent of respondents aged 35 to 44. If your business were to experience a data breach, what do you think the impact would be in the following two areas? The study found that 39 percent of U.S. consumers would prefer to authenticate by entering a personal password or PIN when approving mobile transactions, followed by 22 percent who prefer a fingerprint ID, 21 percent who favor clicking an “approve” button, 8 percent who want to receive a one-time password via text or email, and 7 percent who would rather use facial ID. transaction settlements, which should receive $285 million. In both cases, IDC expects the banking industry to be the largest investor. Blockchain spending will focus largely on IT services and business services, which IDC expects to account for nearly 70 percent of all blockchain spending in 2019, followed by the second largest spending category, blockchain platform software. From a global perspective, the United States will account for the highest blockchain spending in 2019 ($1.1 billion), followed by Western Europe ($674 million) and China ($319 million). However, the spending guide anticipates significant growth in all nine regions it covers throughout the 2018-2022 forecast period. acquire Transfast, a global cross-border account-to-account money transfer network. The transaction is expected to close in the second half of 2019 and is subject to customary closing conditions. Mastercard also announced that it will acquire Ethoca, a technology solutions provider that enables card issuers, e-commerce merchants, and online businesses to increase card acceptance, prevent fraud, recover lost revenue, and reduce chargebacks. Payroc LLC, a merchant acquirer and payment processing organization, announced its acquisition of Detrok Technology Services, a Chicago-based hospitality technology provider. The transaction closed February 1. Payroc also announced the addition of payments industry veteran and Detrok owner James Derby to its executive team. Derby will focus on expanding Payroc’s point-of-sale offerings and footprint. Many businesses are already using AI-powered technologies to improve their data insights to the next level and enhance customer experiences. Sixty-four percent of respondents said they use AI to capture data and learn more from customers, and 40 percent said they use this data to predict customer behavior. Many retailers, however, said they face challenges to investing in AI technologies, including a lack of budget and mature technology and difficulty prioritizing investments. Stay up to date on the latest Intelligence between issues! Subscribe to Transaction Trends Weekly, the official newsletter of ETA, and receive ETA insights, news, ETA announcements, discounts, and more delivered to your inbox every Thursday. Visit www.electran.org/about-eta/email-subscription today. Your EMV Eco-System Made Affordable! eProcessingNetwork.com © eProcessing Network, LLC. All Rights Reserved. All trademarks are the property of their respective holders. 1. Chris Warner, director of state and local policy, Kabbage (left), and Chris Massey, head of global government relations and public policy, Square (right), participate in a panel on online small business; 2. Hon. Phil Goldfeder, senior vice president of public affairs, Cross River (left), and Chris Koegel, director of federal regulatory affairs, T-Mobile, discuss how fintech is addressing the needs of the underserved; 3. Jack Marr, chief risk, compliance, and privacy officer, TSYS, gives the closing keynote; 4. Abeer Bhatia, president of card marketing, pricing, and innovation, Chase Card Services, discusses the latest in mobile payment technologies; 5. Caitlin McCarthy Clarke, manager, cyber readiness and exercises, American Express, participates in a panel on cybersecurity and data breach; 6. Jennifer Speargas, director legal for PayPal Business Financing, discusses online small business lending; 7. John Pitts, policy lead at Plaid, discusses how fintech allows consumers and financial institutions to leverage data. 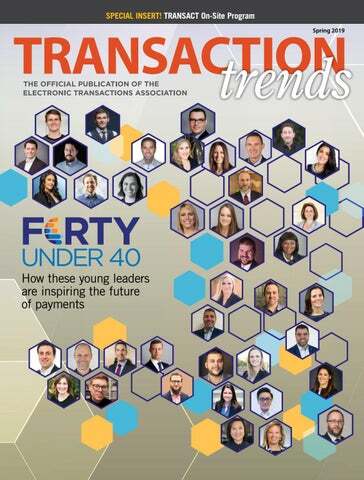 Congratulations 2019 ETA Forty Under 40 Winner Amanda Slater Recognizing our own Amanda Slater for being acknowledged as one of the Electronic Transactions Associationâ&#x20AC;&#x2122;s Forty Under 40 in 2019, which highlights gamechangers at the intersection of payments and technology. ÂŠ 2019 Visa. All Rights Reserved. ne of the hallmarks of American government is its tiered federal system. The 10th Amendment grants powers to state policymakers—legislators, regulators, and governors—that are not explicitly enumerated in the Constitution to the federal government. This distribution of governance between state governments and the federal government creates an elegant republic, balancing power in a federal system, creating local democracies, and providing opportunities for citizens to establish laws based on each state’s individual characteristics. It’s no secret that partisanship has taken its toll on productivity in Washington, DC, a city where proceedings can be altogether lumbering, and the pace has slowed as both sides prepare for the 2020 elections. The ponderous cadence of the wheels of the federal government rarely keeps up with the pace of innovation in our industry. While activity on the federal level has decelerated, the states have accelerated their interest and activity in the payments technology space. Additionally, as budgets tighten in statehouses across the country, and the national conversation on the use of data in the 21st century develops, state policymakers have focused their activities on two major issues touching ETA’s members: taxes and data. states are sure to accelerate, ETA is aggressively responding to meet them with education and advocacy on behalf of our members, merchants, and ultimately consumers. are powered by data. They are critically important in the fight against an increasingly sophisticated foe: criminals and fraudsters looking to take advantage of any vulnerability they can find in the ecosystem. ETA has advocated for privacy protections and regulations that allow space for payments technology companies to continue to do what they do better than anyone else: fight fraud. Working directly with state policymakers to educate them about the important role the payments industry plays in leveraging advanced data analytics to deliver safer and more secure products to consumers is a big priority for us, and we will continue to keep the ways our members secure the ecosystem top of mind for policymakers. As the voice of the payments industry, we’re frequently in state capitals considering policy changes that raise concerns for our industry. We will continue to make investments in demonstrating and advocating for the proliferation of innovative new marketplaces. And the states will continue to be a hotbed of activity this year and beyond. However, through a balanced approach that fosters connections, education, and pro-payments policies, I am confident that ETA’s advocacy will continue to work to create a positive environment for our industry. TT Scott Talbott is senior vice president of government affairs at ETA. For more information, please contact Talbott at stalbott@ electran.org or Grant Hannah, government affairs coordinator, at ghannah@electran.org. as the Electronic Transactions Association and its 500-plus member companies navigate a new frontier of digital commerce. ETA’s role as the premier trade association of the payments industry has always embraced the acquiring channel as its core, but we find ourselves at an inflection point given the revolutionary changes underway in the industry due to innovation, market consolidation, and the entry of new players. And this inflection point increasingly must inform our work as the voice and primary hub of the industry. We’ve expanded our work to capture the addition of new players to the payments ecosystem, predicated on the necessity to engage and retain those players to advance our mandate to grow the industry as a whole. In this way, we intend to create a more robust suite of benefits for all members of the payments ecosystem. For us, this means revamping our ETA Certified Payments Professional (CPP) program to better reflect the new standards and dynamics that drive the marketplace. We know from our members that it’s no longer enough to know basis points and interchange; this information remains important, but a holistic knowledge of the software and technologies that are powering more functional payments solutions is critical for every merchant-level sales agent. This year, we’ll roll out an ETA CPP program that even better prepares the modern payments professional for the challenges and opportunities of the payments industry. Further, it’s about coding next-generation deal making, intelligence, and innovation into the DNA of TRANSACT, our industry’s flagship event. This year, you’ll see features designed to bring together new entrants and old stalwarts, with a focus on bringing to the ecosystem the voices and intel that are driving our industry forward. Ultimately, our role as the nonprofit trade association for the payments industry is to serve as a vital resource and community for our members. The resources we provide must be a value-add. And, while different companies or segments of the industry have different needs, they all share a common element: the necessity for connection and collaboration. With greater efficiencies and vibrant innovations that enable safe, secure, sophisticated, and easy-to-use ways to pay from current players, new players, and even those yet to be named driving the transformation of payments, ETA marches into its second wave of growth with that focus at the forefront of our mission. TT Amy Zirkle is interim CEO of ETA. Reach her at azirkle@ electran.org. At Bank of America Merchant Services, we know today’s companies are faced with shifting consumer shopping behavior, disruptive technology trends and heightened fraud and security risks. In the world of payments, that means you need solutions you can customize, scale and streamline to fit your evolving needs. We’ll help you pinpoint the right solutions that can optimize your global digital commerce and help grow your business. Christopher Ackroyd Director, Product Management, Early Warning www.earlywarning.com If you’ve ever used Zelle, Early Warning’s person-to-person payments network that can be found on many mobile banking apps, then you have Ackroyd to thank. As director of product management, he is responsible for the success of Zelle, the product that has united the American banking industry behind a single payment brand. More than 75 million consumers have already enrolled in Zelle, and the payments network has processed more than 400 million transactions. To continue increasing the number of consumers who enroll in Zelle, Ackroyd keeps innovating and updating the user experience. He also works with banks and credit unions to illustrate that the difference in Zelle is that it starts with a great user experience. Ackroyd’s dedication to the product has increased the number of active senders using Zelle month-over-month since its June 2017 launch. Sarah Adams Vice President, Global Product, First American Payment Systems www.first-american.net With more than 18 years of experience in product management specifically in the financial services industry, Adams has a lot of knowledge on how to successfully implement, integrate, and go to market with in-house and third-party payment acceptance solutions. She shares that knowledge by actively participating in numerous industry associations, and she currently serves on both the Verifone Advisory Council and CardFlight Advisory Council and sits on ETA’s Retail Technology Committee. A results-oriented professional who clearly has her finger on the pulse of the technology that drives the payments industry, Adams is committed to helping drive payments innovation forward— that’s why she’s also an ETA Young Payments Professional (YPP) Mentor. Dimitri Akhrin President, IRIS CRM www.iriscrm.com Before founding IRIS CRM in 2010, Akhrin ran and managed an ISO for five years. His firsthand experiences taught him that the payment processing industry was in need of a reliable and easy-to-use business management tool that manages the entire merchant lifecycle—thus, he created IRIS CRM. The company now helps many ISOs streamline their business and increase employee and client satisfaction. He and his Brooklyn-based team keep the company at the forefront of industry tech offerings by adding advanced features and abilities to IRIS CRM. Brian Billingsley Chief Revenue Officer, Modo www.modopayments.com Billingsley’s work as chief revenue officer at Modo is helping to create an ecosystem for payments interoperability for more than just merchant payments. His previous experience as CEO of Klarna North America has helped shape his perspective on payments. Billingsley understands the alternate payment issues encountered by both consumers and retailers, which enables him to search for new ways to reduce payment friction for consumers while helping his current clients optimize their payment services and systems. Known as a forward-thinker by his co-workers, Billingsley is consistently pushing the envelope when it comes to innovations in the payments industry. Brodsly launched Chosen Payments in 2008, and, within its first five years in business, the company was processing more than $2 billion annually. During the past 10 years, Brodsly has grown the company from a one-man operation to a multilocation business with offices in eight states. His unique formula for success has earned him a spot in First Data’s ISO Clients President’s Club for the past six years. Chosen Payments has consistently ranked in the top three of all First Data partners for year-over-year growth. Under Brodsly’s leadership, Chosen Payments landed at No. 800 on the Inc. 5000 list of the fastest growing private companies. In addition, the company was named to the Top 10 Credit Card Processors in America list by Retail CIO Outlook magazine and as the No. 1 Credit Card Processor in America by Mirror Review magazine. Chosen Payments also ranked No. 33 in a list of fastest growing, privately held companies in the Los Angeles area by San Fernando Valley Business Journal. Kim Bynan Senior Vice President, EBT and Valutec, FIS Global www.fisglobal.com Starting at FIS Global as a financial analyst nearly 13 years ago, Bynan now holds the position of senior vice president and oversees EBT, the nationwide Electronic Benefit Transfer program, and Valutec, the company’s gift and loyalty card solutions. Under Bynan’s leadership, her team has successfully managed the Supplemental Nutrition Assistance Program for more than 30 states and the Women, Infant, and Children program for over 12 million U.S. households, among other accomplishments. Previously, she was the divisional controller for the Emerging Commerce Group, where she managed capital and development for the FIS Payments Division. In 2017, Bynan managed over $300 million in annual revenue, negotiated vendor agreements, and saved more than $5 million annually, while reinventing the capital and development process for over $100 million in capital spend—focusing on executive management transparency into strategic purchases and better tools to manage project selection. Bynan constantly studies the competition and invents more efficient methods to increase customer satisfaction and drive sales—all while making time to mentor her team. risk across the system, and improving merchant loyalty and reducing overall merchant attrition rates. As president of Womply, he is reimagining the relationship between the payments industry and U.S. merchants through data, technology, and value-added services. With Capoccia’s contributions, Womply’s partners have demonstrated an average 17 percent improvement in merchant retention and $2.5 million in annual retained recurring revenue. Prior to joining Womply, Capoccia was part of the founding team of Verifi, a leading provider of end-to-end credit card payment protection for large-scale card-not-present (CNP) businesses. Capoccia holds a U.S. patent for developing a dispute resolution system and method for electronic payment transactions. Ozge Celik Christina Camacho Founder and CEO, Ivy Lender www.ivylender.com Camacho launched the online lending platform Ivy Lender to meet the funding needs of underserved small- and medium-sized enterprises by combining aggregation and funding, and offering single-platform participation for clients in Canada and the United States. Ivy Lender uses artificial intelligence (AI) to aggregate payment data to identify lending opportunities for her clients, and the company partners with financial institutions across North America to build out payment processing and alternative lending solutions. Camacho spent nearly a decade in banking before deciding to go out on her own to provide solutions that aren’t limited to one financial institution’s platform. She started by launching an ISO when she was 29 years old, and she is one of only 20 women who own an ISO in North America. Camacho’s hard work and innovation have been recognized by Wnet; in 2017, the organization presented her with the Making Waves Award for her impact on the payments space. Camacho recently completed the Holt Accelerator in Montreal, where she was the first and only woman fintech founder to participate in the cohort. published “Fundamentals of Card-Not-Present Merchant Acceptance” book series, he is continually contributing to payments industry know-how. Chmiel believes that in the highly dynamic digital threat landscape of today, working together and education are the keys to success. sor BKM, launched two nonprofit organizations—Fintech Istanbul and Blockchain Turkey—that aim to create strong ecosystems in Turkey and secure Turkey’s leadership in the region. Celik provides executive management and content support for both platforms. In this role, she spends time visiting universities to educate students about BKM’s fintech and blockchain opportunities. Celik is driven to create a better payment experience and ecosystem—and to educate entrepreneurs on how to make the most of the opportunities offered by fintechs. Sarah Conner Director, Project Manager—Director of HR, Sphere www.anoviapayments.com There are leaders who lead loudly from the front, and there are leaders who lead quietly from the back, encouraging and motivating those in front. Conner may be the latter, but she is still a powerhouse in the electronic payments space. She has taken two companies—Century Payments and Anovia Payments—from launch to sale. At Century, Conner was its first employee, growing into the role of chief of staff in just six years. With Conner’s contributions, Century Payments was named to the Inc. 500 list as one of the top 100 fastest growing, privately owned businesses in the United States for three consecutive years. After Century was sold for just over $100 million, Conner was recruited by Anovia to help usher in a new era of connected commerce. Partnering with Conner’s large strategic partners, Anovia built annual revenues of $19.9 million in 2015 and $32.2 million in 2016. With Conner’s help, Anovia was named the 82nd fastest growing company in the United States by Inc. magazine in 2017. Because of the rapid growth, Anovia Payments sold to Waud Capital in 2017 and has been coupled with other technology firms in a private equity fund. maven,” Cooper is a master of merchant services and a mentor to women in the payments industry. In her current position at PaymentCloud, she is responsible for providing strategic leadership—and, so far, she’s had great success, making 25 percent gross in revenue for the company within the first 60 days of business. Cooper has been described as “an independent, eager, honest, and transparent human” who cares about the young professionals just entering the industry, her team, and the merchants she serves. Nicholas Cucci Co-Founder and Chief Operating Officer, Fluid Pay LLC www.fluidpay.com As co-founder of Fluid Pay, Cucci is changing the payments space by offering a completely cloud-based payment gateway. He helped develop this secure Level 1 PCI-compliant gateway to enable businesses to process transactions from a variety of different devices, anywhere in the world. He also developed Watchdog, one of the first fraud management tools to use a machine learning algorithm. Innovative and ahead of its time, Watchdog models are exposed to new data, while independently adapting to the data as it comes in—and more data equals more security. Cucci, who has been a certified fraud examiner since he was 21 years old, also helped create the original structure of Network Merchants, where he worked as the director of marketing. Now at 31, he is a true visionary for Fluid Pay and the entire payments industry. Erika Dietrich Vice President, Risk Services, ACI Worldwide www.aciworldwide.com A sought-after industry expert, public speaker, and consultant, Dietrich currently manages a global team of 30 financial risk analysts and acts as a senior consultant on ACI’s top 10 CNP accounts. Dietrich and her team have provided insights and guidance that have been instrumental in the development and rollout of ACI’s UP Payments Risk Management solution, which received recognition and awards for innovation from Finance Monthly magazine, the Merchant Payments Ecosystem, and the UK National Technology Awards. Dietrich’s team provides the expertise that enables ACI customers to take advantage of next-generation real-time fraud management capabilities. Recognized as the driving force behind ACI’s annual Holiday Fraud Benchmark survey, Dietrich also has developed several industry-leading fraud detection algorithms and serves on the North American Merchant Risk Council Advisory Board. A payments industry innovator, Dietrich has developed and applied for a patent for a potentially revolutionary fraud identification tool. Genevieve Dozier Client Business Executive, First Data www.firstdata.com Dozier began her payments career at the age of 22 and, by 30, was a vice president reporting to the president of BB&T Merchant Services. She had oversight of product, marketing, sales support, national sales, and sales training for 80 sales reps, nine sales support managers, 57,000 merchants producing $17 billion in processing volume, and gross revenue totaling $370 million. After leaving BB&T, Dozier faced adversity in her next position as the only female executive. But she learned from that experience and, as a current member of Wnet, feels fortunate to know what it is to have the support of uplifting and inspiring women in the industry. Although she’s only been at First Data for two years, Dozier has already experienced success—signing net new and renewing over $17 million in net revenue. Dozier wants to share with others the lessons of success she’s learned—and, importantly, to communicate that we are, all of us, a constant work in progress. Peter Fitzpatrick Vice President, Payment Networks, Agreement Express www.agreementexpress.com/payments Fitzpatrick’s contributions to the payments industry began while in university, when he worked to help build Canada’s fastest growing company in 2009, VersaPay, then moved on as a 1099 agent of BluePay, FrontStream, and Elavon. After graduating, he joined Agreement Express, leading sales for its payments team for the past five years and working his way up from a junior sales representative to vice president, payments. Under Fitzpatrick’s leadership, payments revenue increased by 259 percent between 2015 and 2017. Over that same time period, the number of customers in payments increased 671 percent. His work has affected many of the industry’s fastest growing and largest companies, including Visa, Authorize.net, Merchant e-Solutions, BlueSnap, Payliance, and others. In 2019, Fitzpatrick will lead Agreement Express’s launch of a standardized onboarding platform for small and medium-sized ISOs and ISVs, and a portfolio transitions tool, automating the application, underwriting, and onboarding process for portfolio transitions. John Florinis Vice President, Payments, TouchBistro www.touchbistro.com Florinis leverages his in-depth knowledge of and experience in multiple disciplines and segments of the payments industry to improve the product and service offerings of the industry. At Moneris, he was part of the team that built the first Canadian acquirer-driven SaaS-based retail POS solution. While at Mastercard, he had global responsibility in delivering digital payments solutions (digital wallets) to technology solution providers across various verticals. Now, at TouchBistro, Florinis oversees the introduction of a new payment solution that will streamline restaurant operations and integrate payment processing, impacting business efficiency and the bottom line. Florinis has been a dynamic influence on moving major players and segments toward the latest technology adoptions and business models that are driving the payments industry now and into the future. optical character recognition, AI, and machine learning. She has met with regulators across the Caribbean and launched retail and digital products and brands both in the United States and internationally. Her passion for the fintech and payments space inspires her to give back to the community by serving on the board of Women in Wireless and leading the Wnet Atlanta chapter. Jaredd Galloway Director of Operations and Complex Services, Paysafe Group paysafe.com Galloway credits having worked for a few small business owners for his understanding of the growth potential of payments solutions in that community. When he started in the industry in 2002, he knew merchants needed an advocate to help them make the right choice when selecting a merchant service provider. Now, that same genuine desire to help business owners fuels his drive to provide a better overall payments experience for his clients. At iPayment, he used his work experience to view relationships from both the business and merchant perspectiveâ&#x20AC;&#x201D;developing a strategy that used data analytics, culture change, employee development, and process improvements to execute a plan that resulted in historically low attrition numbers for the organization. Galloway was a member of the management team when iPayment was selected as the ETA ISO of the Year. He has continued to use innovative data-driven retention and customer service strategies to maintain that attrition decline while also being a key contributor to the Paysafe/iPayment merger. in the Charlotte, North Carolina, financial services and payments scene, leading areas for a joint initiative between local government and city businesses and Carolina Fintech Hub, and serving as a board member on Finsiders, a local fintech and payments organization. Phil Goldfeder Senior Vice President, Public Affairs, Cross River www.crossriverbank.com Goldfeder has almost 15 years of experience in both the public and private sectors—and a strong track record as an implementer who thrives on advancing the fintech and payments industry. In his current role at Cross River, Goldfeder guides the strategy for all policy communications endeavors that position the company as a promoter for the industry on regulation in the payments innovation space. His strong relationships with government officials—at the federal, state, and local levels—make him an advocacy leader, educating regulators and policymakers on the innovations and cutting-edge technology happening in fintech. A valued leader in global payments with more than 11 years of financial services technology management, Jacobs is passionate about payments and makes it his goal to streamline the merchant experience, reduce scope and friction for technology development, and provide meaningful products and services to merchants. A key team member at Global Payments, Jacobs oversees the management, support, and enhancements of enterprise configuration tools to ensure the environments hosting customer-facing applications are stable, consistent, and accommodating for both customers and the application development teams creating the applications. He has played an important role in the payments industry by increasing the feature set and adoption of the dev-ops platform to release new applications and features to customers with quicker turnaround—leading to improved speed-to-market metrics. Jacobs has been lauded for his ability to effectively translate and communicate technical and business needs, enabling the company to drive development and process change that benefits customer experience, vendors, and the industry at large. Megan Karbula Product Marketing Manager, Paya paya.com Karbula was drawn to payments because of the challenging and ever-evolving nature of the industry. She’s held many positions—relationship manager, director of client relations, and business leader—but in her current role as Paya’s product marketing manager, she enjoys producing effective marketing collateral, including webinars, training guides, flyers, and website content, that the sales team can use to effectively communicate the new features and functionalities of the company’s offerings. But Karbula also gives back to the payments community in her work with the Wnet committee in Atlanta. She has helped grow committee events—increasing the number of attendees from 20 to about 60 for each event. She finds her work with Wnet extremely satisfying because it enables her to help people connect, expand their networks, and provide educational opportunities. Leonardis started her work in the payments industry 11 years ago. Since then, she has accomplished many things as a payments professional. In her work, Leonardis joined a technology startup and spearheaded the building of a sales channel to enable it to grow from 0 to 80 acquirers across the United States. She joined a company of five and saw it grow to 50 employees. With CardFlight, she is responsible for all new business development of the company’s channel partners. She also is CPP certified. In the payments community, Leonardis volunteers her time with numerous associations, including the Wnet board. She helped shape ETA’s YPP program and took an active role in ETA’s Membership Committee, where she has held the position of co-chair for the past four years. Leonardis received the 2013 Wnet Trendsetter Award and continues to pave a path for many young women in the payments industry. Craig Nussbaum Vice President, USDM Emerging Verticals, Mastercard mastercard.com Nussbaum is relatively new to the payments space, having spent six years at Deloitte in an accounting role before joining Mastercard’s corporate finance group. Nussbaum wanted to be closer to the business—and make a “direct impact”—so in 2018 he left finance to lead Mastercard’s emerging verticals team. His group works with niche merchant areas where cash is still the predominant form of payment—such as telecos, utilities, rent, education, consumer loans, sports betting, charity, government, insurance, and vending. Nussbaum credits his accounting/ finance career with enabling him to approach strategies and partnerships from a unique perspective. Through those partnerships, Mastercard has seen high double-digit growth in several emerging verticals, including rent, vending, and lottery. Nussbaum also was heavily involved in Mastercard’s Bill Pay Exchange solution, which introduced alternative bill pay and real-time solutions to the market. security, serving on the executive committee of the Merchant-Financial Services Cybersecurity Partnership and as co-chair of the Partnership’s key working group. He has represented the retail industry on several high-level industry committees, including the Federal Reserve Corporate Advisory Group, Federal Reserve Secure Payments Task Force (Steering Committee), and the Retail Industry Leaders Association Payments Committee. In 2015, Luhtanen was recognized by PayBefore as a Top 10 Payments Lawyer. He currently serves on the board of directors of the Special Interest Group for IIAS Standards (SIGIS) and as chair of the board of directors of Apple Seeds Inc., an education-focused nonprofit organization based in Fayetteville, Arkansas. The driving force behind Olenoski’s career has been her desire to lead the transformation of the payments space from a consumer perspective. Before joining Capital One Labs, Olenoski spent several years at Amazon, focusing on the consumer e-commerce shopping experience, and interned with Disney and MGM Mirage, improving the travel and hospitality experiences. She credits her experience outside of the industry for helping her create new experiences that drive the industry forward. At Capital One, she has led the Capital One Wallet app and launched or supported many mobile payments functionalities, including Digital Card Issuance, Apple Pay, and Card Lock. Pauleat has spent her career in fast-paced technology companies, holding senior management roles in the iGaming sector before joining Paysafe (then Optimal Payments) in 2015. She won Paysafe’s Rookie of the Year Award in December 2015 and now heads its Group Marketing Services, where she leads a team of 15 employees across Austria, the United Kingdom, the United States, and Canada. Pauleat is a member of Paysafe’s senior leadership team and is on the steering committee for Paysafe’s award-winning Diversity and Inclusion Program. She also serves as a champion of ETA within her company—encouraging Paysafe employees to get involved in ETA committees. Pauleat has been a member of ETA’s Technology Committee (2015-2016) and has sat on the Communications Committee since 2015. When not managing Paysafe’s presence at TRANSACT or other industry events, Pauleat is active with Wnet. She is co-chair of its Membership Committee, is a member of its MarComs Committee, is the founder of the Wnet Montreal Chapter, and is a Wnet Champion, a Wnet Board Advisor, and recipient of two Wnet awards in 2018: Making Waves and Event of the Year. himself and others on payment security and PCI compliance best practices. In the PCI space, he is a well-known and respected PCI Qualified Security Assessor. Through his guidance and assessments, he has personally contributed to the PCI compliance efforts of thousands of merchants— including small retailers, health-care providers, universities, chain stores, and more. One of Punzirudu’s admirable characteristics is his drive to share what he has learned, and ensure that others grow alongside with him. aging the five-and-a-half-year partnership, during which he sourced add-on acquisitions and supplied product ideas, strategy, and execution consultation. Sadek currently serves or has served on the board of directors of leading payment firms, including BillingTree, BlueSnap, Cardworks, Cayan, eTix, Official Payments, Periscope Holdings, and Zelis Healthcare. Garima Shah Chief Business Development Officer DC, Priority Payment Systems prioritypaymentsystems.com Since she began her career in payments 14 years ago, Shah has been a field agent and an ISO owner, has run direct and indirect sales channels, has worked for an international processor, has been through several large enterprise acquisitions as both the buyer and seller, and has converted companies from retail to FSP. She has learned a lot along the way, and she shares that knowledge with industry veterans and new agents as a speaker at regional trade shows, TRANSACT, and other national conferences. Shah has brought her passion for payments to Priority Payment Systems, where she manages and develops its ISO sales channel and negotiates acquisitions of both portfolio and fintech solutions—successfully completing 18 acquisitions in the past three years. She also helped develop a payment facilitator product and sales channel and assisted in transitioning the company through its recent acquisition. vance Visa’s policy priorities. One of her most important achievements has been helping to build out Visa’s ability to demonstrate the innovation taking place in the payments industry through various experiences. This ability is instrumental to translating what is and will be happening in the marketplace to policymakers who are writing legislation, according to Slater. Her vast experience in payments policy includes previous positions as senior policy advisor on banking, trade, and corporate law issues for Sen. Tom Carper (D-Delaware) and as a committee staffer for Rep. Ed Perlmutter (D-Colorado). Benny Silberstein Co-Founder, Payrix LLC www.payrix.com Silberstein is the co-founder and one of the visionaries behind the Payrix Platform. Founded in 2015, Payrix is an enablement technology for organizations involved in facilitating payments. That includes SaaS providers, ISOs, marketplaces, acquirer/processors, banks, and any organizations involved in omnicommerce. Payrix’s payment facilitation platform provides those organizations with a streamlined solution that enables merchants and payment facilitators to easily board; process; conduct know-yourcustomer/anti-money-laundering services; and provide risk and chargeback solutions, settlement, and payment and payout solutions. Silberstein’s background is rooted in payments, and he operated a full liability ISO for years— an experience that taught him the limitations of acquiring platforms and guided him while being principally involved in the conceptualization, design, and oversight of the Payrix Platform buildout. Swislow is establishing himself as a key voice in the payments government relations space. At Square, he leads interactions with policymakers in Canada and the United States, on state and local levels. He has led the response to key financial services and lending issues with state policymakers and has been leading Square’s education effort of local influencers in key municipal areas with a focus on bringing payments and lending to underserved communities. Cindy Turner Head of Product, Core Acquiring, JPMorgan Chase www.jpmorganchase.com Turner’s impressive payments career includes positions at KKR Capstone, First Data, Visa, and now JPMorgan Chase. Those who work with her state that she leverages her data insights and client demands to better understand how to develop immediate client needs, anticipate future industry trends, and commercialize all launches so they are market ready. At JPMorgan Chase, she manages and leads all product-related activities—including, but not limited to, product development, product enhancements, payment brand release, etc. Ultimately, what clients say about Turner is that she not only understands the current payments landscape but also has the capacity and foresight to assist in navigating future trends as they come to fruition. ed partnerships with industry leaders such as Vantiv, First Data, Blackhawk Network, and Berkshire Hathaway. In addition, Valentino added over 200 partnerships with leading brands such as Amazon, Target, and Best Buy. At Web.com, he hired, trained, and oversaw a team of account managers responsible for over $100 million in partner revenue with industry leaders such as Google, Amazon, Discover, First Data, and PayPal. His leadership has proven essential in two sizable industry transactions, including the sale of GiftCards.com to Blackhawk Network in 2016 and the 2018 acquisition of JetPay by NCR. capabilities that they had been promised, they found “consistent authorizations, a pretty low incidence of problems, and not a whole lot of issues with merchant account funding speeds,” McAdam says. “And so, the fundamentals of the service work well—and work well across the marketplace.” The research, which will be explained in more detail by McAdam during a presentation at TRANSACT on May 2, examined the four main contributors to merchant satisfaction scores and identified some differences across types of processors and types of merchant verticals. These four main factors—cost of service, which was determined to account for 31 percent of the satisfaction index; service interactions, 27 percent; payment processing, 23 percent; and equipment and technology, 19 percent—were determined by examining 19 total attributes that drove the J.D. Power model; the attributes were found to have different weights according to their importance in the overall satisfaction index. These four factors, which fall in line with what successful payments processors are finding in their own internal studies, also demonstrate the importance of communication and measurement when seeking to boost customer satisfaction. Earn ETA CPP Continuing Education Credits. Continue reading this article, pages 30-34, then visit www.electran.org/certification/eta-cpp-quizzes to test your knowledge and earn 2 ETA CPP CE credits per quiz! sential to improving customer satisfaction with pricing clarity and the reasonableness of total merchant services costs. At TSYS Merchant Services, cost is one element that plays a part in satisfaction, explains Damian Tanenbaum, senior vice president, customer experience and contact centers. Ensuring that merchants “are charged the amount they expect to pay for products and/or services they purchased” is critical, he says. But price is only one piece of the puzzle—and because costs can be comparable among processors, it’s important to offer services and products that distinguish companies. The other three areas of focus TSYS prioritizes, according to Tanenbaum, are making certain products work as designed and described to merchants, resolving customer concerns when the first call comes in, and ensuring the customer service team provides follow-up. Cory Capoccia agrees that processors must look beyond price. “As we’re all aware, payments processing has become commoditized,” says Capoccia, president of Womply, which partners with processors, acquirers, banks, and ISOs in offering software and customer-facing services for small businesses. “The key to keeping customer satisfaction scores and loyalty high lies in the additional value provided to those customers. As technology continues to expand and permeate every aspect of our lives, SMBs want and expect access to more tools that help them compete.” Rather than talking about “saving a few dollars on processing,” most processors are “recognizing that the cost conversation easily takes a back seat when merchant service providers are able to provide real, valuable solutions,” adds Capoccia. on “in-person” services than other related sectors J.D. Power has studied. “This really looks like an industry that is much more ‘inperson’ oriented than what we see in retail or small business banking,” McAdam says. More than 70 percent of respondents “told us that their most recent interaction was with a person,” meaning an in-person meeting, phone call, email, or online chat. By contrast, “only 10 or 15 percent of these small businesses said that going online or going on a mobile app—some type of self-service technology—was their most recent interaction. And in other facets of banking, it’s [about] half.” McAdam notes that building more comprehensive websites and mobile apps to drive self-service interactions could ultimately reduce costs for processors, but he acknowledges that the small businesses surveyed may genuinely prefer personalized services. Payments experts agree that personalized services are in demand and help drive satisfaction among SMBs. One of Womply’s main keys to success, for example, is “actual human interaction,” says Capoccia. “For many SMBs, we’ve found that no amount of chatbots, self-serve libraries, or automated processes can replace their desire to pick up the phone and talk to a live person who understands the ins and outs of the product as it relates to their specific business and who can quickly remedy any issues or concerns.” An important related consideration is attrition rates—an area many processors have recently re-examined in their own customer satisfaction initiatives. Keeping new customers satisfied by onboarding quickly and being responsive to client concerns has become a key focus among many merchant services providers—especially those who serve SMBs. At Elavon, for example, Joe Myers has led initiatives to retain customers and support business growth from 2011 to 2014 in Europe and from 2014 to present-day in the United States. To address problems surrounding attrition, Myers conducted a company-wide analysis and identified a need to reduce the time it takes to bring new customers onto its platform. Myers took a personalized approach, both in Europe and the United States, to improve customer service: First, he bolstered “dedicated account management, to each and every customer … where we proactively call out to them on a regular basis to ensure that they are satisfied with the services they are getting.” Second, he launched a “straight-through processing” (STP) program to reduce the time that lapses between a merchant’s initial onboarding and the completion of its first transaction. And third, he developed a customer account management program, creating a team of more than 100 employees to serve as resources. This program went above and beyond the support system previously in place and facilitated outreach with merchants. Myers’ approach had a positive impact on service interactions. After full implementation, the average time frame required from initial signing to first transaction decreased from 36 to 10 days in Europe, and from 38 to 10 days in the United States. The percentage of applications being activated within the first 60 days of signing at Elavon increased from 65 percent to 80 percent. Even more significantly, the company’s overall Net Promoter Score (NPS) has increased by 150 percent since 2014, says Myers. BlueSnap’s Dangelmeier concedes that “personal touches” can be costly for processors, but he feels they are necessary when serving small merchants. SMBs “are not looking for the lowest price. … They’ll pay a little bit more to get a better product and better service,” he says. technologies don’t have the same rate of improvement,” he says, “which makes it difficult to address any customer satisfaction gaps in a timely manner.” At TSYS, the company’s cloud-based solutions enable the company to push software updates overnight. “As new ways to pay get introduced, such as Apple Pay, merchants have to have the capabilities to take these payments from their customers,” Tanenbaum explains. “Updates to these POS systems are pushed over the cloud, typically overnight while a business is closed, and therefore don’t have any impact on the merchant or their ability to take a payment or make a sale. 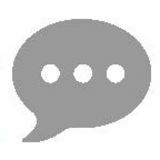 These types of technologies have greatly attributed to the satisfaction of a small business customer.” Abram notes that new technologies are key in making payments easier—but only if they are well researched and implemented successfully. “As long as the sales and support teams are thorough in the sales solution stages, and provide solid support throughout the onboarding cycles, new technologies … can be a key differentiator and a driver of exceptional client satisfaction,” he says. “However, if not managed and deployed efficiently, these technologies can potentially frustrate business owners and reduce satisfaction.” To ensure their merchants have access to optimal and well-running advanced solutions, many processors team up with technology firms. “A number of [processors] are really doing things to invest and partner with more innovative POS system technologies that are designed for different types of merchants,” says McAdam. Measuring and boosting satisfaction is an important way for processors to drive success. Measurement tools such as the new J.D. Power study, NPS scores, surveys, and similar means are essential. “If you can’t measure it, you can’t prove that what you’re doing is working,” says Dangelmeier. But putting forth a valuable product and fostering honest and open communication play important roles as well. “One of the most important ways to keep a small business owner satisfied is to do what you say you’re going to do,” says Webster. “Transparent business practices are very important, along with genuine follow-through and delivery on your promises.” Maintaining “a customer-centric mentality” also is a key ingredient to success with SMBs. “Running a small business is risky, scary, and hectic,” says Capoccia, “and small business owners deserve technological solutions to their most pressing problems—namely, growing revenue, getting more customers, and saving more time—and they deserve merchant service providers who are educated on these solutions and can act as trusted advisors to help customers navigate the crowded technology market space.” TT Christine Umbrell is a contributing writer to Transaction Trends. Reach her at cumbrell@contentcommunicators.com. Cash discounting is when a merchant offers a customer a reduced price in exchange for the customer choosing to pay in cash. This practice is most commonly seen in gas stations, where the published price of a gallon of gas is advertised with a disclaimer stating that the consumer can pay $0.05 less per gallon if they pay with cash. A surcharge is when a merchant adds a fee or otherwise increases the price of a transaction when the customer pays with a card. In a nutshell, cash discounting is legal, allowed by the card brands, and, in fact, explicitly encouraged by some state laws. Surcharging is not explicitly prohibited at the federal level or by most states, and, as of 2013, is allowed by the card brands with some restrictions. ecent clarification from Visa has made some waves in the payments industry concerning what constitutes a cash discount versus a surcharge, and when to apply each. While confusion around where the regulatory authority lies and what the implications are for merchants still exists, this recent clarification from a major card brand provides greater certainty and welcome clarification for a segment of merchant acquiring sales that has largely evolved without oversight and led to products that misinterpret the previously cloudy topic. So, what is the difference between cash discounting and surcharging, why is there still some confusion, and how are recent enforcement efforts driving change for the industry? rules against the practice of surcharging. But a class-action law suit in January 2013 pursued a settlement attempt that reversed this cardbrand restriction with certain conditions. As of Jan. 27, 2013, a merchant may add a surcharge to certain credit card transactions under the following conditions: • Merchant must provide card brands with at least 30 days’ notice of the merchant’s intention to surcharge. • Merchant must register with both Visa and Mastercard. • Surcharging applies only to credit transactions in the United States. Debit and prepaid cards cannot be surcharged. • The maximum for a surcharge is capped at 4 percent but cannot be higher than the merchant’s cost. • Disclosure/signage mandates include the following: • Merchant must provide clear disclosure at the point of entry and point of sale. • Itemization of the final surcharge amount must be identified separately on the transaction receipt. add a surcharge if they post the total dollars and cents charged to credit card users. California’s law was challenged in court on similar grounds, with the 9th Circuit ruling in early 2018 that the state could not prohibit merchants from imposing a surcharge on customers paying with a credit card. The 11th Circuit struck down Florida’s ban on surcharges in 2015. And in August 2018, a federal court declared that Texas’s surcharge law was unenforceable. This was after Texas transferred enforcement of the credit card surcharge prohibition from the Office of Consumer Credit Commissioner to the Texas Attorney General. The attorney general provided clarification to the prohibition and, in doing so, confirmed that a Visa-compliant surcharge program was also compliant as far as the Attorney General’s office was concerned. No federal law bans the practice of surcharge. However, the Durbin Amendment, a provision of U.S. federal law passed as part of the 2010 Dodd-Frank reform, addresses the issue of surcharging in the context of defining a cash discount. Section (b)(2)(A) states that a “… payment card network shall not … inhibit the ability of any person to provide a discount or in-kind incentive for payment by the use of cash, checks, debit cards, or credit cards.” As long as merchants clearly disclose the terms of the discount, they may offer a discount or in-kind incentive to customers who choose to pay with cash. However, section (c)(4) states, “The term discount: …. (B) does not include any means of increasing the price that customers are informed is the regular price.” Hence, the Durbin Amendment clearly stipulates that, while the card networks may not prohibit cash discounts, any product, service, or mechanism that adds on a fee to the regular price of the transaction does not qualify as a cash discount. David Leppek is an executive payment consultant and a member of ETA’s Payment Sales and Strategy Committee. Caroline Hometh Payments veteran Caroline Hometh is the founder and managing partner at RPY Innovations, a global payment advisory group that specializes in establishing relationships that enable conversion of cash to electronic payments and fosters the growth of domestic and international acquiring. Here, Hometh offers tips and strategies for U.S.-based payment facilitators and acquirers looking to expand abroad. We know that card-based transactions are big in the U.S. but not so much in other areas of the world. What are some of the most interesting cultural preferences for payments you’ve come across in your work? way. It is simply making a purchase. Our industry needs to allow consumers to shop in whatever currency they prefer, with whatever payment type they’re comfortable using. Which areas show the most promise for U.S.-based payments players? One of the reasons payment facilitators are so successful is their commitment to a unique vertical, [which] also allows them to research which markets match their vertical focus most effectively. Using the lunch scenario, how did the payments players enable the woman to pay? The payment facilitator that is focused on parking transactions will need to develop an acquiring relationship in each country/region where consumers are used to paying for parking but no longer prefer to use coins. The meters will need to accept the card types preferred by that country. EMV certification is required. The mobile application will need to consider multiple languages and colors that reflect the culture. It may choose to use partnerships to support the meters in a specific region. The global or regional restaurateur will need to consider how consumers value loyalty programs and payment methods. The e-wallet and P2P provider will need to accept bank transfers within each country of interest. The e-commerce shoe retailer may need to accept up to 22 currencies and 140 payment types and work through foreign exchange risks. The payment facilitator who is focused on charity transactions will need payment partnerships to set up local bank transfers, credit cards, recurring payments, and have access to card account updates. What is the current regulatory and licensing environment like for U.S.based players in those markets? and stringent and thus will be time-consuming. For example, in Europe, due to Payment Service Directive II, all payment facilitators must first obtain a payment institution (PI) license from the country’s financial control authority (or equivalent). If obtained from an EU country, it can be passported to other EU countries, but if Brexit is completed, the United Kingdom will likely require a separate PI license. Are there any downsides to global expansion? It takes time and commitment to understand a new market and regional requirements, build a business, modify as needed, and begin a new path if initial plans do not work. Expansion into another country can be expensive. There are the different regulatory standards that must be met. Cultural differences require attention and may be difficult to incorporate. Often, branding and colors must be reconsidered to avoid misinterpretation and increase appeal. Businesses hope that payments will function the same way as they do domestically—and find it frustrating when that doesn’t happen. Remember that when entering a new market, local players view what’s done in the U.S. as unusual and not especially relevant. What’s the best advice for a payments provider looking to expand abroad? Smart Retail Solutions Come see the most innovative payment solutions that are elevating the checkout experience, offered by PAX Technology. ARIES8 | E500 | E700 | A920 | E600 A diverse lineup of solutions with multiple functionalities, suited for any merchantâ&#x20AC;&#x2122;s needs.